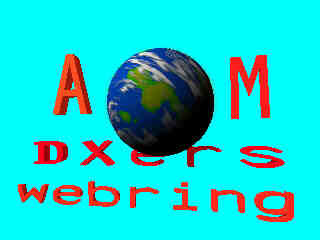 The AM DXers Webring is a FINDLINK member. 34 popular sites for free, using one form! This webring is primarily for any AM DX enthusiast (updated 4/6/99). Check out recent DX CONDITIONS in Duluth, MN area. Any interests in FM, TV, SW, HAM, and PIRATE radio also! If any problems occur with the webring, let me know right away! I will attempt to fix any problems immediately! You will be emailed two table codes to choose from. Please place one of our tables on your index page. I will be notified when your site has been submitted. you have presented on your webpage, I will add your site to the activemembers of the ring. YOUR SITE WILL NOT BE ENTERED INTO THE RING IF ONE OF THE TWO TABLES IS NOT PRESENT! I will notify you if your site does not comply. If your site is not submitted within a week and the table is on your index page, please email me immediately! BELOW ARE YOUR TABLE CHOICES! BUT, if you'd rather keep graphics down to a limit on your page, that's okay. with two html codes listed. Following first is our table complete with graphics. BELOW is what our "NO TABLE" code with links only looks like on your page. This is an example, the text code for both table and non table versions for yourchoosing will be sent to you upon your site submission. Add either one you to your main index bottom. enter you in the ring. have been any problems with the ring or your url, etc. Be sure the html code for one of our two tables is on your index page! and PLEASE follow our instructions. BE SURE to type your email and url's correctly!